I’ll be the first to admit that I am a complete card nerd. I have been collecting and playing a variety of TCGs ever since I was a child. I have books full of Pokemon, Yu-Gi-Oh!, and Magic the Gathering cards, but aside from heading down to the local gaming shop, it can be difficult to find others to play with. It’s for this reason that I often indulge in online TCGs. Unfortunately, I find it difficult to find any free-to-play card games that will hold my attention for more than a few hours. Most of these releases feature very expensive card packs, force you to spend real money, or are simply “broken” in terms of their gameplay. It hasn’t stopped me from checking out the newest releases to hit Steam though, so as soon as I heard about Spellweaver, I knew I had to give it a try. Let me first start off by saying that Spellweaver is a beautiful game. That’s a good thing; in fact, it’s one of the solid selling points to any TCG. A gorgeous, animated title-screen greets you each time you open the game, followed by a sprawling map that features many intricate details. Each realm is given its own localized area within the world and is surrounded by expertly-drawn landscapes. Entering a battle will take you to a fully-3D-rendered battleground, split down the center by golden gilded accents. Developers spent a lot of time perfecting the look and feel of Spellweaver, and their work really shines through. The cards themselves have to look good too, and they manage to do that exceptionally well for this release. Card types fall into the traditional categories of color-based, much like they do in Magic the Gathering. You’ve got Rage (red) cards that feature powerful goblins, ogres, and war machines. Wisdom (blue) cards that focus mainly on intelligence-based magic. Order (yellow) cards that feature healing spells, templars, and angels. A Nature (green) set that showcases elves, forest beasts, and nature magic. Those of you who prefer to dabble in dark arts will find Corruption (grey) cards packed with undead creatures and reanimation spells. 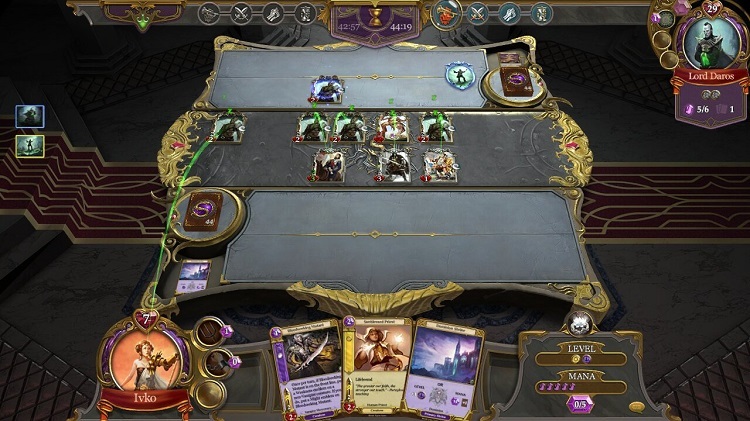 Lastly, if you’re seeking something a little different, you can choose Dominion (purple) cards that allow you to take control of enemy creatures, confuse your opponent, and gain an upper hand through science. Each subset has its own unique strengths and weaknesses, but each deck is capable of standing against another. It’s all about winning and securing the best cards for your realm of choice, a journey that is fulfilled through hard work and a little bit of luck. I consider card purchasing and trade-ins to be one of the better aspects to Spellweaver. One of my biggest qualms with games like Hearthstone and Infinity Wars is that it takes such a long time just to secure one card pack. The grind can get rather annoying when you’re pouring all of your strategy into a difficult one-on-one fight just to make a tiny fraction of what you need to secure a new booster pack. What’s even more disheartening is opening that pack only to realize that you didn’t really secure many cards for your deck of choice. Spellweaver does a couple things that really help to break up this awful grind. For one, it doesn’t take nearly as long to amass the funds to purchase a booster pack. Through daily quests and versus battles alone, you’ll find yourself stockpiling coin quickly. What’s even better is that you are not penalized for playing against the A.I., allowing you to gain money to purchase stronger cards before you venture out into more competitive places. On top of that, Spellweaver allows you to purchase two specialized booster packs: one for good and one for evil. The good pack will contain cards from the Wisdom, Order, and Nature sets, while evil packs together Rage, Corruption, and Dominion. This gives you much better odds when you’re trying to secure cards for your given faction, although it is important to note that these booster packs are a little more expensive to purchase. Now for the other important aspect of a good TCG: the gameplay. The battle system for Spellweaver implements a lot of gameplay elements from previous TCGs. In order to summon cards, you’ll not only have to pay their “Mana” amount, but also match their power level. This can be done through special cards that are similar in a way to the lands used in Magic the Gathering. Once each turn, you can turn one of these cards into either a mana point, or a power level. This adds a small layer of strategy to the game as it forces you to decide what you’ll need to focus on gaining in each turn. Some of these cards even feature special hero skills that your chosen hero will learn once the card is consumed. The hero card system works much like it does in Hearthstone. Each hero has its own special ability that will not only consume mana, but will have to recharge over a certain amount of turns. Much like Hearthstone, the key to victory is depleting the opposing hero’s health pool. This aspect isn’t as straightforward as most other TCGs hitting the market. Summoning creatures in Spellweaver isn’t just about damaging a hero, as you can use creatures to successfully defend against attacks. This creates an extra layer of strategy that must be considered during each turn. Sometimes it’s impossible to attack your opponent head on, forcing you to deal with their creatures first. Unfortunately there are certain things that take away from the Spellweaver experience. For one, there aren’t exactly a lot of cards to collect. Each set has an equal amount, and some cards are harder to find than others, but at the end of the day this release doesn’t pack a ton of variety. This can make it fairly difficult to gain any kind of strategical advantage over players as you progress further into your card-collecting quest. This lack of content is understandable, though. Spellweaver hasn’t been on for an extended period of time, and I’m sure we can expect developers to add new card packs, heroes, and content in the near future. The one upside here is that you should be able to get your hands on almost every card in the release, before any of that content comes out. Another qualm I have with Spellweaver’s combat system comes in the form of post-turn healing. Each time your cards are engaged in a skirmish, and their damage is calculated, any remaining cards will heal back to full health for the next turn. This can make it incredibly hard to smite a powerful card and it makes it much easier for a player with the right hand to simply dominate the field of play. Imagine a scenario in which your enemy possess two very strong cards. There is nothing to stop them from steamrolling your lower-level creatures, and makes it almost impossible to attack their hero directly. Unless you can manage to pull a rabbit from your hat and draw a powerful magic spell, you’ll find yourself in a pretty deep hole. Sometimes you’ll find yourself mounting an incredible comeback, only to be shut down (literally) by the servers. One of the most agonizing issues plaguing Spellweaver is the lack of stability in the servers. A lot of players have complained on this issue and I’ll admit it crept over me a few times. There is nothing more aggravating than losing your connection mid-match, or struggling to even connect to an opponent via the versus menu. These issues are all fairly easy to cure though, except for the issue of healing post-battle — that is something developers will need to take a long look at. 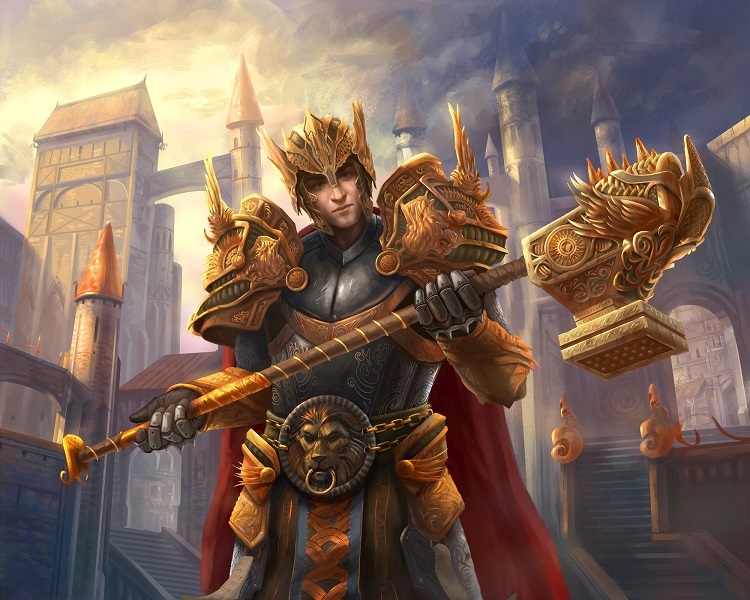 Still, issues aside, Spellweaver is a fantastic addition to the free-to-play virtual TCG genre. It has an incredible amount of promise, features some fantastic art, enthralling gameplay, and has a lot of room to accommodate future growth. Hopefully the development team will continue to work hard on correcting issues and will bring dedicated fans some impressive content additions in the near future. A large-scale infusion of new cards and missions would easily springboard Spellweaver up the popularity ladder. If you’re interested in getting more information regarding this TCG, be sure to check out Spellweaver’s dedicated homepage here. You can also download this release right now on Steam. If you want the inside scoop on new cards and art, be sure to follow the developer, Dream Reactor, on Twitter and Facebook.